This fall season REV'IT! is releasing the Trocadero H20 Gloves with a slew of trickle down professional protection in a shell that looks little more than a casual, chilly weather, glove. At first glance, the REV'IT! Trocadero H2O Gloves look like what your grand-dad used to wear while shoveling snow. Robust, functional, comfortable, all come to mind when describing the aesthetics. Despite the muted exterior, the Trocadero H2O Gloves are packing a visco-elastic knuckle protector, SEESOFT™ and PWR | shield at the palm, as well as stealthily added reflective material across the back of the hand. These highly functional features are in addition to the winter punch carried by a hydratex® membrane with a combination of Thinsulate® G, a synthetic high loft fur liner and a tri-fleece liner. The connect finger is 'icing' on the proverbial cake. Like REV'IT! 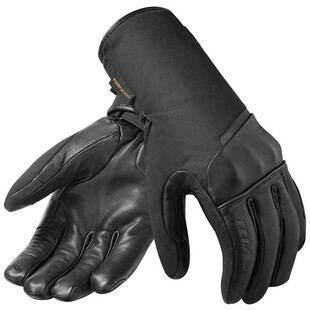 's previous winter glove line, the one-handed closure design is a carry over making ingress and egress a snap. The REV'IT! Trocadero H20 Gloves are for the rider looking for the best balance between protection, comfort, and classic aesthetics in a winter glove. Keep it upright out there!